I used this app when trying to conceive my first born. I mainly used it for tracking symptoms and cycle days. The community factor, in my opinion, is horrendous. Having this ability in the app is just a way for women to question themselves and over analyze everything going on with their body. We are already stressed enough, wondering if this is our month. Then you add on negative comments when you ask a simple question. It’s great and all to know someone else is going through the same thing as you- it’s comforting. But for people to outright just diminish a woman’s hopes of being pregnant is awful. I think this feature needs to be either altered or removed all together. I love Ovia and I used it when I was TTC (my now 3 year old) and since I loved it so much I wanted to start using it again, however this go-around we are not (yet) TTC and the app is heavily TTC influenced. So I would appreciate a version that was more for avoiding pregnancy. However, this app is beautiful, easy to use and overall the best fertility awareness app I’ve seen. Thank you! I think I gave this feedback years ago when I last used this app and I’m disappointed to see that it hasn’t been fixed. There are more ways for cycles to end than “pregnant” or “not-pregnant” - and miscarriages, ectopic pregnancies, and failed IVF attempts are all still really valuable information to be able to record. I hopeful that they’ll consider add those options in. The app says 12+ I’m 12 and started my period at 11 and I was born 2007 and it wouldn’t let me it would only let me do 2005 and under which is weird and they should fix that. 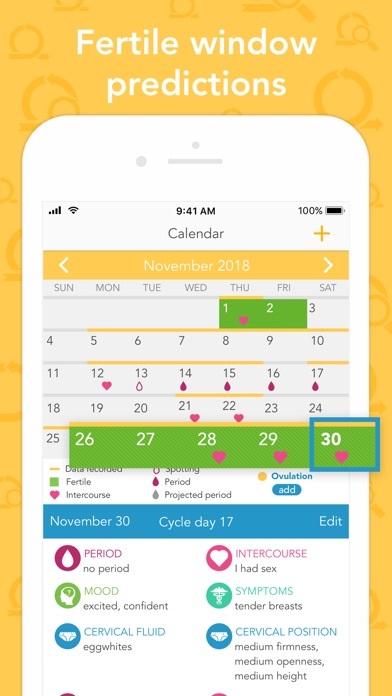 I have been using the app since I discontinued my Mirena and it has been accurate, especially for my first cycle and helping me get on track for my cycle and ovulation days. I tested during its recommendation period and was right on target. This is the cleanest and most easy to understand fertility app I've found. And it doesn't have a ton of ads with the free version. HOWEVER when I log my period or ovulation test, it does not recalculate it's prediction of my ovulation window. Even after force quitting the app and trying again, it does not refresh like it should. I have 3 fertility apps going just to compare and this is the only one with this major glitch. Hopefully this can get fixed bc I love all the info this app provides! TTC and this is so informative and easy to track your cycles. Love this, it has become my go to everyday to track symptoms and read tips and articles. My cycle was pretty unpredictable (at least to me) so I was using 3 apps to track and all were giving me different answers. 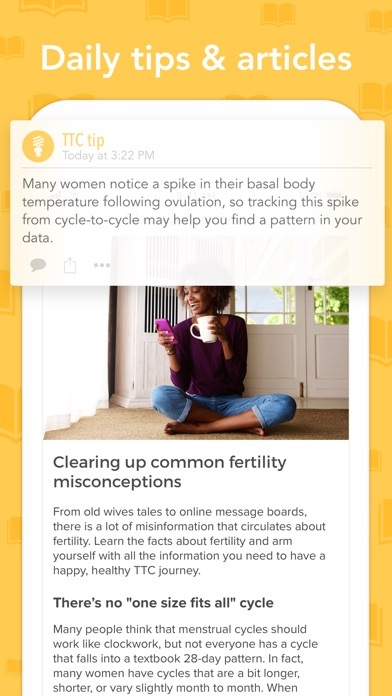 This app noticed when I had an atypical ovulation indicator that the other apps ignored. It was the only one to accurately predict my cycle. And Ovia pregnancy was the BEST pregnancy app. I love this app, but really wish you could input photos of LH testing strip results to track progression. I have swapped apps because Ovia is missing this function. So how am I supposed to give my best effort to get pregnant with the help of this app if it changes my fertile window DURING the week of the (supposed) fertile window. I now use my CM for some guidance. This app is full of hot air. After getting off birth control, my periods took months before they were regular again. I was able to track when I was most fertile and ended up conceiving after one try! I love this app! I have been using it for going on 5 years. The developers are quick to reach out and solve problems. It continues to get better over time. 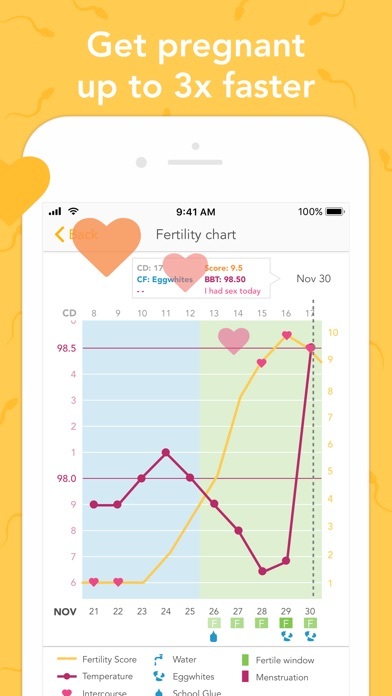 Ovia is great for tracking my cycles and has really helped me while trying to conceive. I do wish the Community Tab were a little bit more intuitive. I love the anonymity of it, but would love to be able to “like” comments or even be able to reply to comments. Additionally, it would be nice to be able to get a more obvious notification when someone comments on a threat/question you posted on. The community of Ovia is one of the coolest additional features of the app so it would be great to see development in that area. Otherwise, I’m very happy with the functionality of the app and all of the valuable information it gives!! I use this as my go to for tracking my period. It is 100% right on. At this time I’m not trying for a baby. Easy to use and track my flow. Easy to understand and easy to use. Helpful tips and articles for expanding your knowledge of menstrual cycles and a lot of help for anyone trying to conceive and I guess by extension anyone trying NOT to conceive (^-^) Would recommend to anyone who wants to know ahead of time and be prepared when Auntie flow might come around. There’s a great community of ladies from all walks of life ready to help with questions that one might be uncomfortable asking a family member or friend. It’s anonymous and everyone is super supportive and most of all NON-JUDGEMENTAL. Mothers, recommend this to your preteen daughters. Ladies, recommend this to your friends. The app has stopped working for me. Literally years of cycles are no longer showing up. Predictions are gone, all I get is question marks. What gives?? I’ve used other period apps and they’re mostly inaccurate due to my irregular period but this app! Is so accurate and even with pregnancy it’s accurate with ovulation and fertility week! Love how on target this app is! I can plan trips and activities knowing exactly will I be in the mood or available for it based on my period and stages! Love how useful the articles are as well! 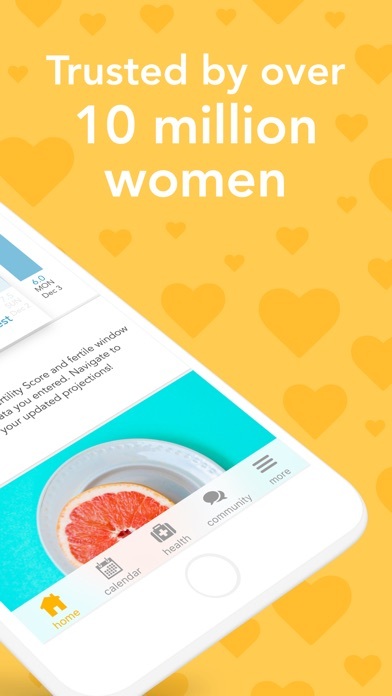 There are so many things to love about this app, but I will say that it allows me to personalize my feminine health! It seems like many women’s apps are made for tracking ovulation and attempting conception, but I’m not at this stage right now. This app allows me to indicate that I’m not looking to conceive and still helps me see patterns in my mental and physical health (I.e. if I’m feeling frustrated, happy, blah that day, what PMS symptoms, if any, I’m experiencing, etc.). 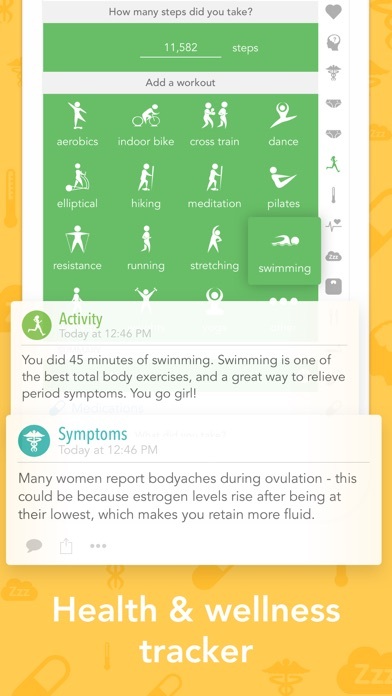 I should also mention that I’m a meant life health Therapist and recommend this app to my girl teens who are looking to know more about their body and reproductive health! I’ve only been using this app for about a month and a half because I can never seem to keep track of my period but they estimate your days and got it completely right the first time which just had me overall tickled! 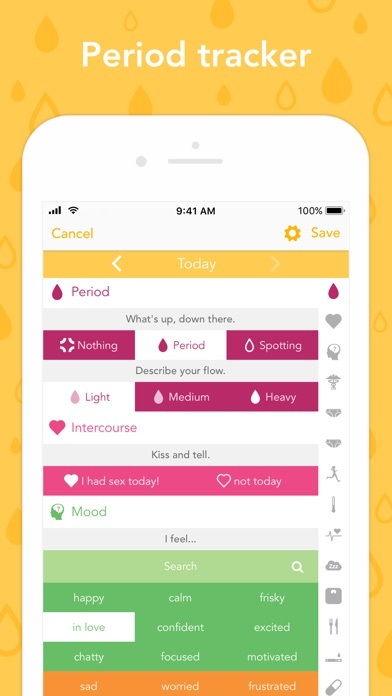 They offer articles every day to help you with anything health wise and let you document your feelings/stats to help organize your health this app has just made my life a little bit easier and it’s so much better to know when my period is starting and to have health articles at my fingertips and tuned to my health. I love this app. Omg ! Because of how great this tracker is I have 2Beautiful Babies . It’s so accurate, that why I try to recommend this app to all my girls that are trying to conceive . The app has wonderful potential but for some reason it keeps saying that I ovulate 8 days before my period and I know that’s not possible. I have a very regular cycle and put all my information in correctly but it keeps saying I ovulate really late and I hate it because I’m trying to convince. Ovia is great! You can track everything all in one place & I love the daily tips and things to read. Very informative. I used My Days app and their tracking is so simple and accurate. I tried Ovia because the other app had too many ads that popped up, but I still use it thank goodness because it is so much more accurate. Recently my period has not been as on time as normal and Ovia has not adjusted accordingly. Beware of your ovulation date not the fertility days. It said I was fertile after I ovulated which is very false and could lead to some disappointed women. There are also way too many questions and I feel that it could add to someone’s anxiety if they are struggling to get pregnant. I do not recommend this app. It’s not the kind of app I can spend hours on but it gives me what I need. My doctor recommended this app to keep track of everything. The best thing is you can put in a lot of information or just a few things. It is fun keeping track and Learning facts about things as I go along. I absolutely love this app. It gives you everything you need to know not only with your period but with ovulation and trying to conceive, tells you when you can take a pregnancy test and gives you a scale from 1-10 how high your fertility rate is. Amazing! Love love loveeeeee this app so much! 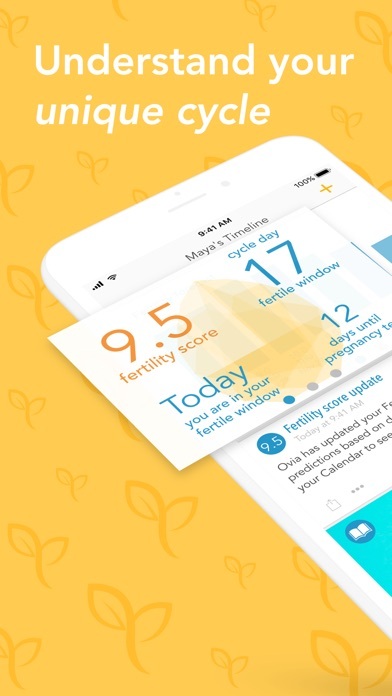 As a previous Flo user I searched for a better period and fertility tracker and I found Ovia! It interacts with you, asks questions, and have a wide variety of data for users to log. I was just truly unhappy with Flo and I was with them for years. I just hope Ovia doesn’t disappoint me like Flo did. So far it is a great app. I love this app for the most mart but have been going through getting my periods regulated after stopping birth control. I have had very irregular periods and this app doesn’t track anything after cycle day 28 and then assumes the next one will be a 28 day cycle even though my last cycle was 35 days. It makes it really confusing and not accurate for ovulation days. I have used this app for several years and it’s always been one I enjoy using. It’s great at predicting what’s to come after a couple of cycles and does give awesome tips and stuff about many different topics. I will admit my only complaint is that I don’t like the trying to conceive tips all the time. Even if you change the setting you won’t stop seeing the TTC tips. I found it hard seeing these after my youngest daughter passed in 2018 so to avoid hurt I avoided my app. I’m still spotty about using it but my personal grief doesn’t change how great of an app it is! 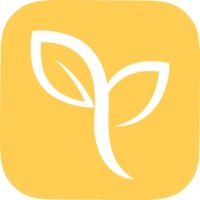 For my both of my children I also used the pregnancy app by Ovia and it was just as informative and fun to keep up with. Ovia makes awesome tools that are easy to use and so beneficial! After years of using it , it now won’t calculate my estimated next cycle. Helpful in every sense of the word!!! I’ve tried using a series of different apps to track my very irregular cycle, also TTC so this app has helped a lot! It’s filled with information, and it’s so easy to track everything you need to! Honestly this app has messed up my information so much . It’s really annoying . It gets confused on my period . I don’t like it . It’s the worst . No point in using the app. It messes the cycle up and even my fertility doctor said so . This app is the only app I have used consistently and actually cared to log my info on. I am so glad to have this app. It even lets you log things in the past even when you don’t remember the day of. This app is spectacular. Ps- I almost never write reviews so this is special.